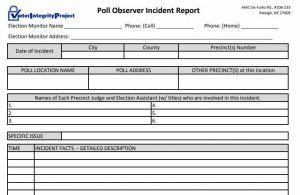 VIP’s Updated Incident Report Form is Ready for Your Stories! Whether you see fraud at the polls or just an irregularity, nothing will change unless you tell people who can do something about it and THAT’s why we want to hear from you. VIP’s Incident Report will help make sure your evidence gets a full and fair hearing, so please fill it out as completely and as accurately as possible. That said, if you don’t know or don’t recall certain details, then just say so! To download your copy of the VIP Incident Report, please click the above image or the hyperlink to the left of this picture. The key is to be as truthful and accurate as you can. After completing the details, be sure an sign it, and then mail it to us, using the address on the bottom of the form. We promise to take care of the rest!